The Perth Mint of Australia unveiled the 2013 design and release date of one of its most popular annual bullion products. Beginning Monday, September 3, 2012, three sizes of the 2013 Australian Kookaburra Silver Bullion Coin series will become available. On the reverse of the newest silver issues are two young kookaburras sitting on a tree branch above flowering foliage. Inscriptions atop the artwork include AUSTRALIAN KOOKABURRA and below it are 2013, the corresponding coin size, and 999 SILVER. The Perth Mint’s mint mark, P, is to one side of the design. 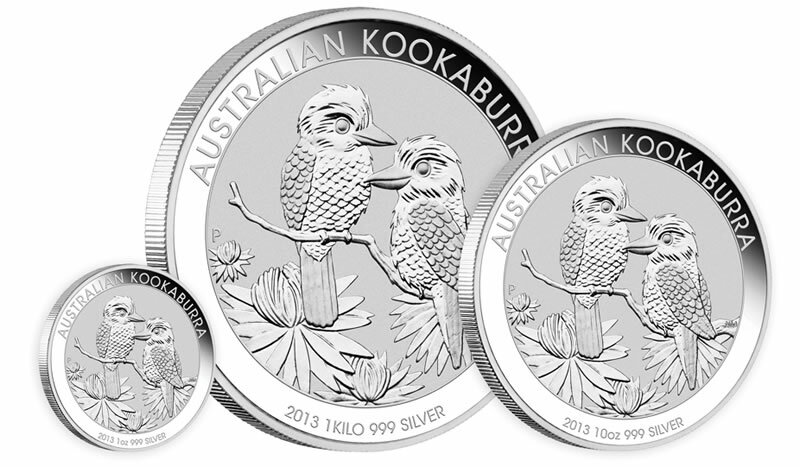 2013 Australian Kookaburra Silver Bullion Coins come in three sizes. All feature the same reverse design. Shown in the image above is the one-ounce size. As with all Australian legal tender coinage, the obverse design has Ian Rank-Broadley’s effigy of Her Majesty Queen Elizabeth II and inscriptions that include the face value of the coin, ELIZABETH II and AUSTRALIA. 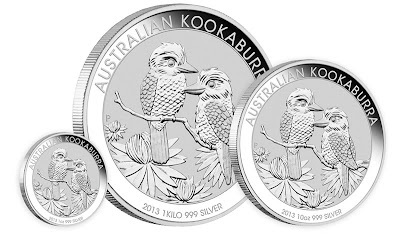 Investors and collectors alike may purchase the $30 denomination one kilo coin, the $10 ten ounce coin, or the $1 one ounce 2013 Kookaburra silver bullion coins with the assurance that all three are composed of 99.9% pure silver with weights and purities guaranteed by the Government of Western Australia. The sizes are the same since 2010, but the 2013 one ounce coin is limited to 1,000,000 while the one kilo and ten ounce coins will be minted to meet demand. Previously, mintages for the one ounce size was limited to 300,000 in 2010 but was raised to 500,000 for the 2011 and 2012 issues. Kookaburras first appeared in The Perth Mint’s silver bullion coin series in 1990 and were well received. Kookaburras are iconic Australian bush birds known for their cry that almost sounds like human laughter. When The Perth Mint introduced the series, the policy of rotating new designs annually was put into place and a fan following developed soon after. Below is a table of mintages for past one-ounce issues in the series prior to this years remintings. The above mintages were last updated by the Perth Mint on April 13, 2012.